Avian encephalomyelitis (AE) is a common viral infection which causes tremors of the head and neck, and progressive ataxia in young chicks, between 1 to 3 weeks of age. The disease is caused by an enterovirus, called avian encephalomyelitis virus (AEV). 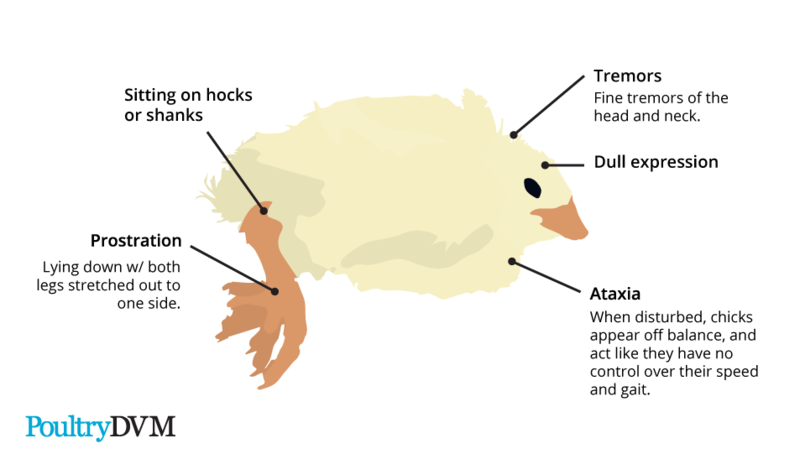 Often the first sign of infection in chicks is depression, soon followed by loss of coordination, drooping wings, rapid muscle tremors of the head and neck (less commonly, the wings and legs), sitting on hocks, and falling over sideways. Chicks may also become paralyzed, and observed lying spread out on the ground in a severely weakened state. Without intervention with supportive care to ensure chick stays hydrated and eating, chicks will often die from starvation or from getting trampled to death by other flock members. Some chicks may only be mildly affected and recovery completely. Older chickens that are infected with AE often show no clinical signs of being infected, other than an occasional decrease in egg production in laying hens. Chicks that recover from AE may have ongoing coordination issues, become permanently blind in one or both eyes, and have an increased risk of developing cataracts. There have been many other incidences where chicks hatched from chickens that have recovered from AE go blind for no apparent reason. Introducing a new, often older chicken to the flock that is either an infected subclinical carrier of the virus or has recovered from AE. The breeding hen was infected with the virus, and passed it to the newly hatched chick from the egg, through vertical transmission. If eggs are incubated, about 25% or more die just prior to hatching. Hatched chicks that are infected with AE will generally develop signs of infection anywhere from one day to three weeks. Chickens that are infected shed the virus in their droppings, which contaminate the environment and ingested by other flock members. The virus is shed in the droppings of infected chicks for up to 2 weeks. Chicks infected by vertical egg transmission start to develop clinical signs anywhere from one day to three weeks after they hatch. When infected by direct contact with diseased birds, signs of infection may take at least 11 days to start to present. Chickens which survive the disease have a higher chance of developing cataracts later in life. The disease usually occurs when chicks are 1-3 weeks of age. . Introducing a new adult chicken to the flock, especially if they are intended to be used for breeding purposes.